Just thinking about the morning routine on a school day creates a physical reaction in me. My head hurts slightly and I feel my body tense. Of all the transitions we regularly have in our family this is by far the hardest. Why is that? We have very few places we have to be at a particular time. When we meet friends I aim to be there on time but a few minutes here and there doesn’t matter, generally we all have children and understand. My 9 year old attends Brownies each week and that doesn’t feel so pressured, if we were late it wouldn’t really matter. However, if we are late for school, I would feel bad, the children would be upset, it’s just not acceptable. At this point, I want to add, we have never actually been late for school. The school run started for us 6 years ago when my eldest started preschool. I do most of the school drop offs and I still feel this pressure! 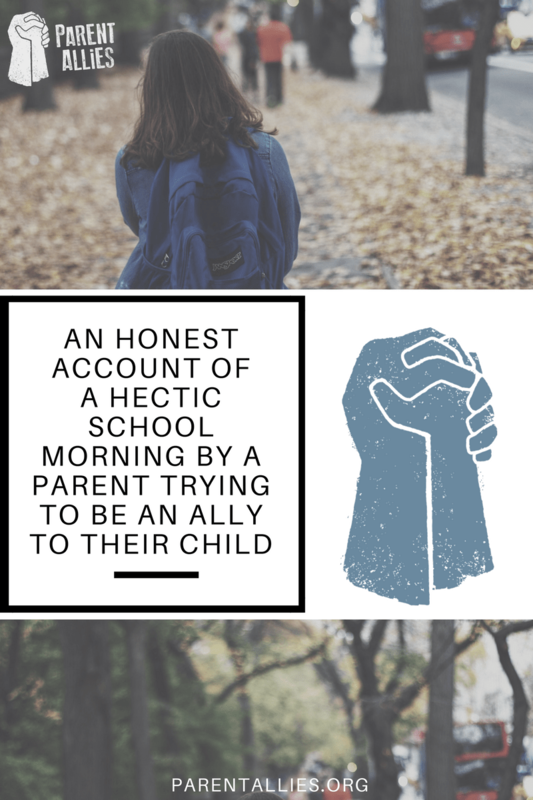 This parental stress can make respectful parenting and being an ally to children quite tricky. 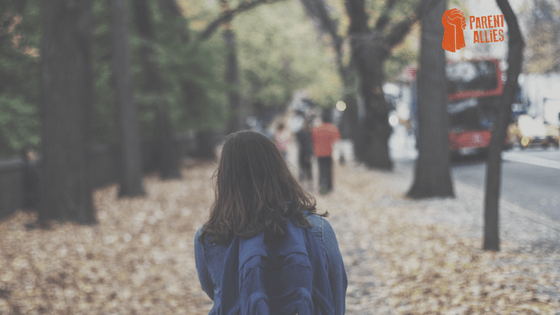 A recent morning unravelled in a way only school mornings seem to do so I thought I would share how I managed and mismanaged my stress. pack lunch. I knew this, we had talked about meals at the start of the week and I had even written it on the calendar as a reminder. I am not good at fitting this in during the morning but I had forgotten to make it the night before. No problem though, I remembered at 7am- one and a half hours until we need to go so plenty of time to put a lunch together. So instead of sitting down with my children for breakfast, I started searching for suitable food. No bread in the house but I found some cooked pasta that I had frozen. This will be fine with pesto and cheese stirred in. So I started trying to break up the pasta so it would fit in the lunch box, not an easy task I can tell you! (I really don’t know why I didn’t just defrost it in the microwave!) It was a pretty annoying job to do, taking quite a long time and all the while my feet kept sticking to the floor as a result of over-use of icing sugar during my children’s baking session the night before! However, perseverance paid off and a pack lunch was created for my daughter. This meant no time for my breakfast, though. I always have breakfast. I’m one of those people who is always hungry! I started to feel annoyed that my basic need for food had not been met. However, no time to dwell on this. The clock is ticking, the school bell will be ringing soon (they don’t actually have a bell in the morning but I need to add some appropriate drama to this situation!). So we plough on with getting dressed, applying sunscreen, tying up hair and brushing teeth. The children are ready with some time to spare. Out comes the tablet for a quick play (whilst I run around trying to get myself dressed and presentable). Five minutes before they need to put their shoes on I let my children know how much time they have left. At this time, my husband is about to leave for work and he tells me the cupboard “stinks” (not happy, hardly an appropriate goodbye!). I think it’s a rotten potato (yuk!). I will need to investigate once I get home, eat breakfast, tidy the kitchen with breakfast pots strewn everywhere, empty the dishwasher and perhaps I should tackle that sticky floor! Five minutes later, I calmly say it’s time for us to put our shoes on. This is met with an angry reaction from my youngest. I can understand, it is so frustrating being asked to stop something before you are ready (I felt this myself, just now, when my eldest came to speak to me when I am in full writing flow). So, I validate her feelings and explain we must stop now so we can get to school on time. I add that this is what we have to do as part of choosing to go to school (my children have actually made this choice, they know home education is an option). So, still a little unhappy (with me feeling a bit rubbish for having to spoil their fun) they put their shoes on. because they could hate me right now but I feel resentful, don’t they realise how hard it is for me!?! (of course they don’t; they have no experience of being a parent). I decide to just think before I speak. Eventually, after being calmed slightly by walking and thinking (just thinking and not reacting) I say to the children how hard the morning has been for me. That I had no help and so had no breakfast. They listen and my youngest said I could have asked for help (of course I could, they are not mind- readers). I apologise for being shouty and, as always, we get to school on time. When walking home, I hear other parents talk about the “nightmare” morning they have had. I realise this is stressful for many, if not most, parents. I reflect on my morning, what I did well and what I could do better. I’m pleased with how I continued with the morning mostly calm, I could have lost the plot much earlier and for longer and how I also continued to give my children notice about how long they had left to play even though I was rushing around it would have been easy to forget to do this. I also validated my youngest child’s feelings when she didn’t want to stop playing. I am trying to be kind to myself as I think we should all do. Things don’t always go well but it’s not necessarily all bad. tomorrow, not my children. So often, I hear “My children are so naughty”, “They never do what they are told” etc. I totally understand those comments, I have said them before now; it’s the traditional way of looking at children’s behaviour in our culture. However my stress is not their problem and it’s up to me to find ways of handling it and to not be triggered but instead interact calmly and respectfully. how to stop an angry reaction. I always have a spare 90 seconds (though it might not always feel like it!) in my morning to pause and not react. Attempting to do this has meant subsequent mornings have run more smoothly. We are about to embark on a fresh school term and I am going to keep practicing these small habits of regulation and self-care if the knowledge that if I can manage this I can manage anything that school mornings can throw at me! Rhubarb and Runnerbeans about her adventures towards a more respectful and gentle way of interacting with children and the planet.